U.S. Drug Enforcement Administration Acting Director Chuck Rosenberg speaks during a news conference at the DEA Headquarters in Arlington, Virginia, June 6, 2017. 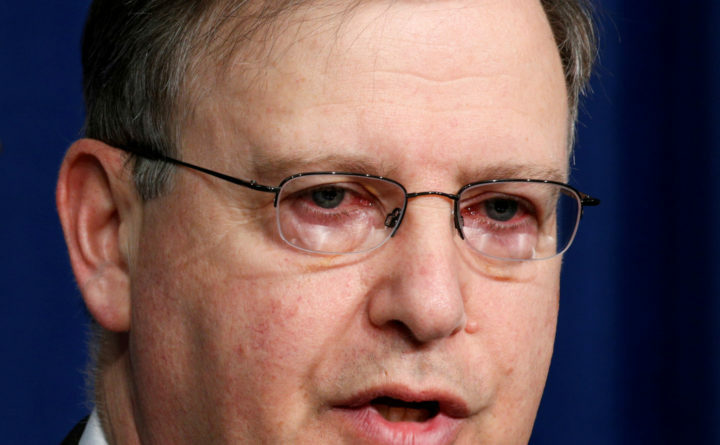 WASHINGTON — Acting Drug Enforcement Administration head Chuck Rosenberg, a veteran attorney and law enforcement official who has found himself at odds with the Trump administration in recent months, told staff members Tuesday he is planning to step down from his post in less than a week. His departure is not completely surprising; President Donald Trump was always expected to nominate someone of his own choosing to lead the nation’s premier agency on narcotics enforcement. Rosenberg, who had been running the agency in an acting capacity since 2015, had earned a reputation as someone willing to put himself at odds with his bosses in the White House and the Justice Department. A former U.S. attorney and senior counselor to then-FBI Director James Comey, Rosenberg garnered attention in July when he wrote an email to DEA personnel rejecting Trump’s comments suggesting criminal suspects might be treated roughly when being put into police vehicles. “We have an obligation to speak out when something is wrong,” he wrote in the email. It was not immediately clear who would replace Rosenberg, although people with knowledge of internal discussions said Col. Joseph Fuentes, the head of the New Jersey State Police, was thought to be a leading contender. A state police spokesman declined to comment. Other names also have been discussed, said people familiar with the deliberations. According to two officials familiar with the matter, Deputy Attorney General Rod Rosenstein had previously asked Rosenberg if he would be interested in serving as the presidentially appointed head of the DEA, and Rosenberg declined. Because Rosenberg was considered a career Justice Department employee, one of the officials said, Rosenstein then asked if he would be interested in another Justice Department job, and Rosenberg said he would not. A Justice Department spokesman declined to comment, and a White House spokeswoman did not return a message seeking comment. Some at the DEA expressed surprise at how suddenly Rosenberg would be leaving his post. Whoever Trump nominates will inherit primary responsibility for handling the DEA’s response to the opioid crisis, along with thorny issues involving marijuana enforcement and research. Rosenberg also has been at loggerheads with Justice Department leaders over marijuana research. The department, according to officials, has effectively blocked the DEA from taking action on more than two dozen requests to grow marijuana to use in research — to the dismay of Rosenberg and others. Attorney General Jeff Sessions has taken a hard line against marijuana and is generally opposed to easing restrictions on the drug. Rosenberg and Sessions also have different views on the Central American gang MS-13. Sessions has called combating the gang a priority for federal law enforcement, while DEA officials have cautioned that other gangs — such as Mexican drug cartels — are far more dangerous when it comes to distributing and selling narcotics because of their financing and organization. Fuentes is a career law enforcement officer who has led the New Jersey State Police since 2003. He harshly criticized the Obama administration for striking a deal with Cuba to restore diplomatic relations with that country without addressing the question of long-sought fugitives, including one who killed a New Jersey state trooper in 1973. “We approach the next presidential administration with a renewed sense of optimism and moral superiority that justice will prevail,” Fuentes said in a statement in January.